Irene Cholewka, a local artist, showcased her stunning photographs that were captured in the local parks. The walls of the Lakeshore Grounds Interpretive Centre were adorned with photos of stunning wildlife, including snowy owls, snapping turtles, coyotes, minks, muskrats and red-tailed hawks on Wednesday. It was the launch of LIFE — in Colonel Smith Park, a photography exhibition by local artist Irene Cholewka. “She’s really great at capturing those really special, rare moments in the park,” Pagacz said. “I think the exhibit shows the range and diversity of wildlife that exists in the local area, just a walk away from campus,” she said. “It gives a glimpse into that and maybe encourages people to take their own walk into the park to see what they can find,” Pagacz said. Cholewka has been a resident of the neighbourhood since 1974. She remembers the psychiatric hospital that used to occupy the grounds, when they first started transforming it to Humber College, and when the park didn’t have the paths it has today. She later attended the college as an administrative studies student. Years later, she would begin taking photographs of the area she knew so well. Cholewka said her favourite season for photography in the park is the spring during the Whimbrel Watch. “Local photographers are outside by 4:30 a.m. and wait for the whimbrel, a bird with a crescent-shaped beak, to fly over a spot in the park called Whimbrel Point. The birds sometimes stop and rest on the nearby rocks,” she said. Cholewka also loves taking photographs in the fall. Many of the photos in the exhibit are close-ups of flowers, buds and other foliage from unusual perspectives. Antonius Lo and his wife Jennie, friends of Cholewka, attended the exhibit launch to support her. Antonius worked as a commercial photographer for a Japanese company in Indonesia before moving to Canada. He now practices photography as a hobbyist. Jennie said Cholewka had introduced her and her husband to Colonel Samuel Smith Park. “We’re so happy to know Irene, you learn a lot of things from her,” she said. Jennifer Bazar, curator of the Lakeshore Grounds Interpretive Centre, met Cholewka when she won a juried competition with the photo of a coyote featured at the entrance of the current exhibit. The award was part of an exhibit organized by community group Friends of Sam Smith Park. Bazar said Cholewka’s work fits in perfectly with the mission of the Interpretive Centre, which is to preserve and share the different histories of the Lakeshore grounds: mental health, ecological history, indigenous history, as well as educational history. 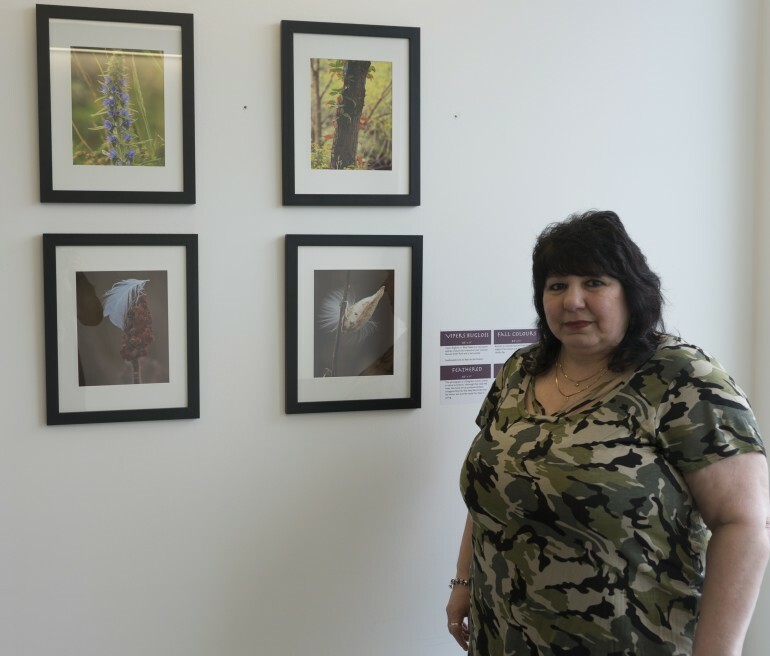 “Irene’s work is really great because every photograph is not just along an ecological theme but it’s also physically in Colonel Smith Park,” she said.